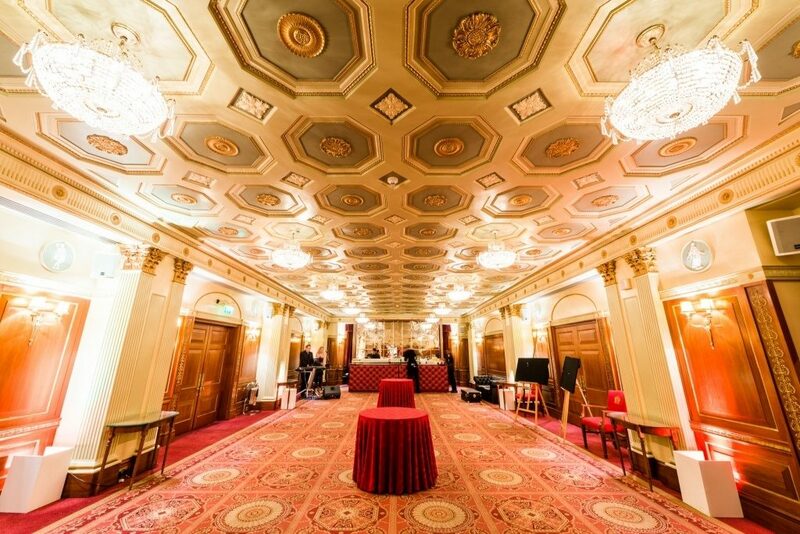 Plaisterers’ Hall sets the scene for outstanding corporate events in London. 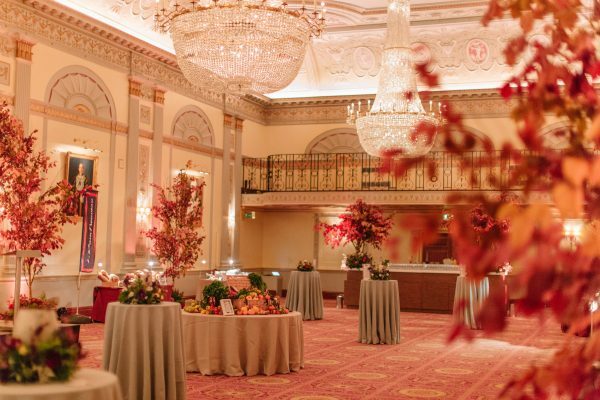 Located in the heart of the City, the corporate events venue boasts elegant and beautifully finished neoclassical decor throughout, creating a luxurious atmosphere for entertaining. 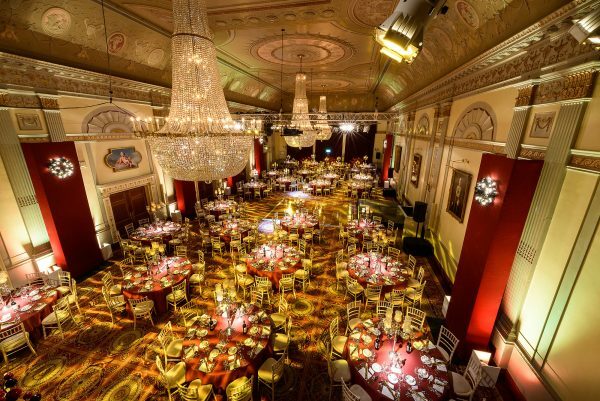 Plaisterers’ Hall offers a wide range of event spaces, suited to events large and small. The spaces include the large Great Hall, and smaller adjoining spaces such as the Mott Room, Livery Hall, Humber Room and Reception space. The range of rooms allows great flexibility for events; use the spaces individually for smaller occasions or create a corporate event that makes use of the entire venue – smaller spaces are perfect for breakout rooms, tea and coffee breaks and welcome drinks. 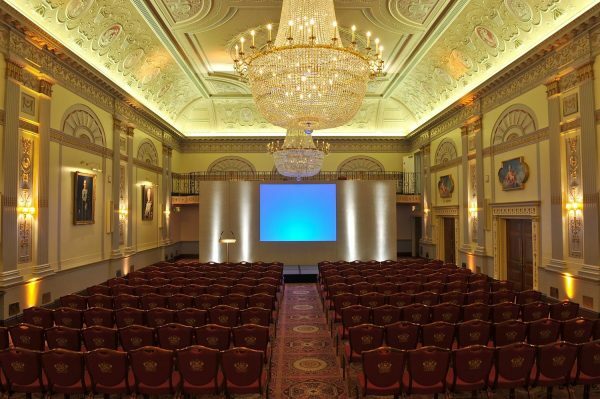 – up to 400 guests for seated theatre style events such as conferences and presentations. The main space is destined to impress with its corniced ceilings hanging with the finest gold chandeliers and floor length windows. Décor speaks of the grandeur of a bygone era, with beautifully finished neoclassical design inspired by the beauty of 18th Century architecture. 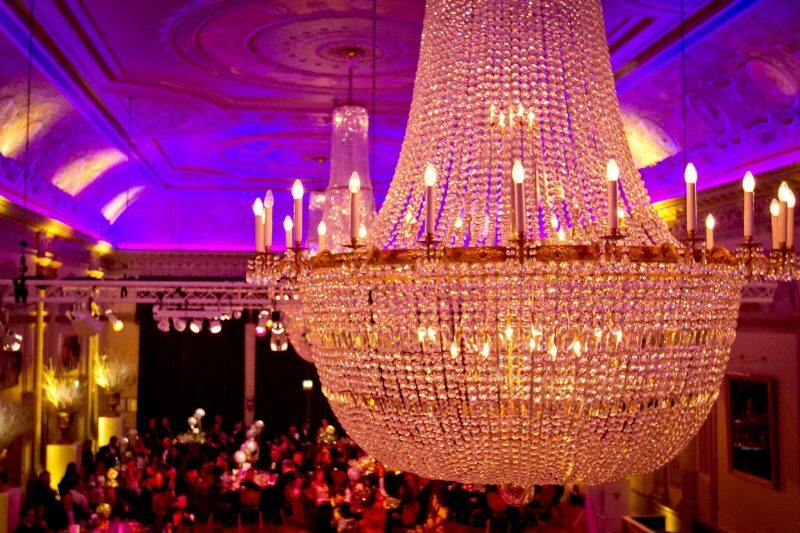 The space regularly hosts corporate occasions from conferences and presentations to awards ceremonies. 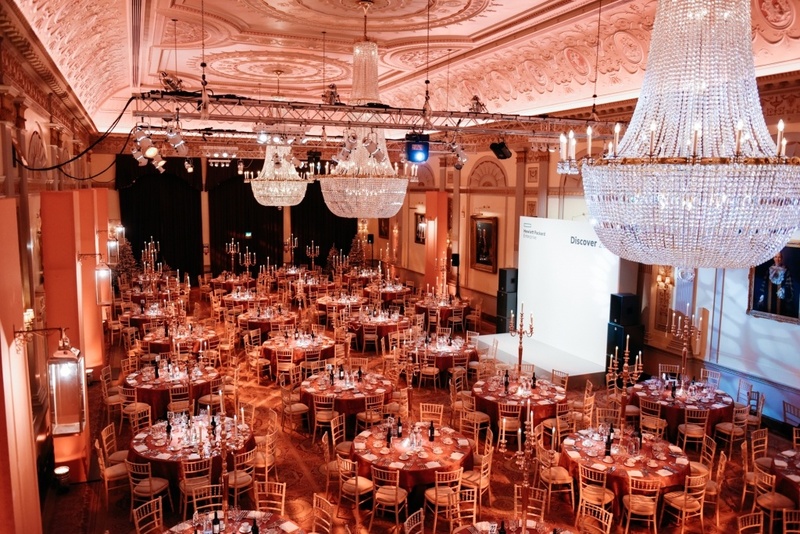 The largest of the additional event spaces is the Livery Hall, which is suited to receptions, dinners and theatre-style events for 30 to 220 guests. The Humber Room leads directly off the Livery Hall and is an elegant room that lends itself perfectly to sumptuous private dinners for 5 to 20 guests. The Mott Room is located off the Great Hall, and is suited to private dinners for 5 to 16 guests, or can be used as an additional space for larger corporate events in the Great Hall itself. 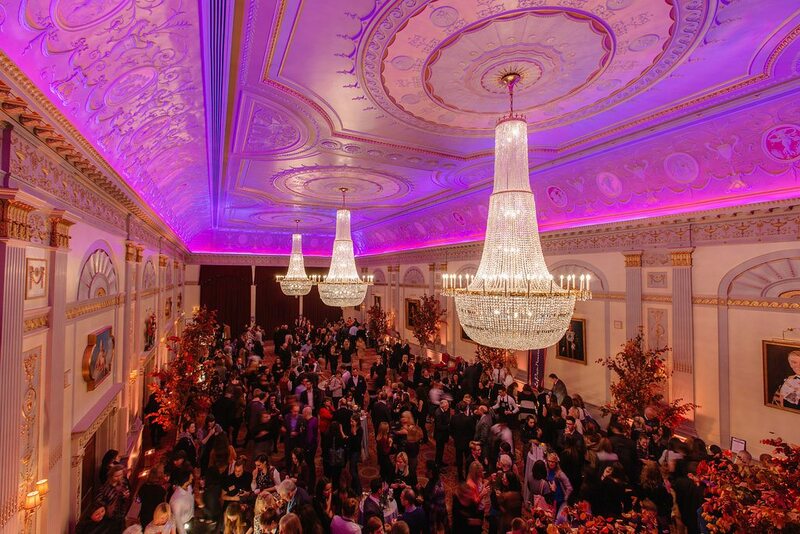 With catering provided by our award-winning bespoke caterer, Create, Plaisterers’ Hall is the perfect choice for your next awards ceremony. Whether you’d like to treat guests to an indulgent seated dinner before revealing those all-important winners, or would prefer to host a more informal night of awards with bowl food, canapés or even food stations, Create Food can assist with the ideal menu for the occasion. Our menu designers can also create a bespoke menu for the night, fitting your guests or theme perfectly. 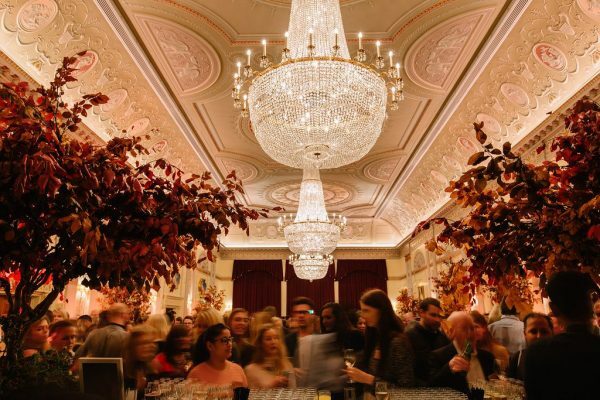 Menus at Plaisterers’ Hall can be tailored exactly to the individual requirements of your event, taking into account the profiles of your guests, budget and personal preferences. Allow us to take the hassle out of your event with our range of fully inclusive packages, incorporating catering, drinks, staff and entertainment. 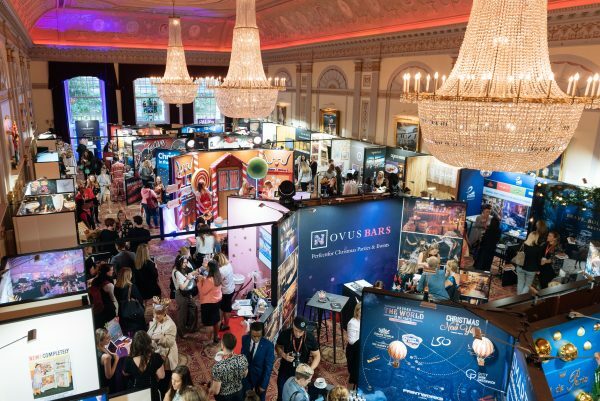 Our experienced team of event managers will work with you every step of the way to ensure all requirements of your event are met. Our in-house event management team are on-hand to cater for any bespoke requirements, leaving you to relax and enjoy your event. Our team are supported by on-site technical staff, who can provide an extensive range of audiovisual equipment to make your corporate events a success, whether you’re looking to light up your conference, enhance your business meeting or ensure your products get their moment in the spotlight.